In the original Star Trek series, Dr. Leonard "Bones" McCoy was forever running around the USS Enterprise with his tricorder, a fantastic space-age device that could scan anything and diagnose medical conditions in an instant. For nearly five years now, dozens of engineering teams from around the planet have been competing to design a real-life tricorder that approximates the functions of the famous Star Trek device. This is no goof-around competition, either: The winner stands to receive millions of dollars in funding from chip manufacturer Qualcomm and the nonprofit organization XPRIZE, which specializes in these kinds of incentivized competitions. This week, Qualcomm Tricorder XPRIZE officials announced that two teams of finalists have made it to the last round of the competition, having designed tricorder-style medical devices that are actually pretty space-age in look and function. Weighing in at less that five pounds each, the devices can diagnose and interpret 13 different health conditions within minutes, while continuously monitoring five different vital sign metrics. The technical requirements for the competition are a bit more detailed — you can read about them at the XPRIZE guidelines page — but the basic goal is a portable medical device simple enough for the general public to use right out of the box. More than 40 teams signed up for the competition in 2012. The top two teams will now advance to final consumer testing. The first of the two groups, strictly alphabetically, is Dynamical Biomarkers Group (DBG), a team of physicians, scientists and engineers in Taiwan. The team is sponsored by mobile technology company HTC and led by Harvard Medical School professor Chung-Kang Peng. The DBG device is built around a modified HTC smartphone and a series of sensors that connect to the phone via Bluetooth. All the components fit into one box, which charges all the devices within via a single USB cable. The DBG Tricorder is built around an HTC smartphone. The other finalist, Final Frontier Medical Devices, is led by Pennsylvania brothers Basil Harris, an emergency room physician, and George Harris, a network engineer. The Frontier tricorder kit employs a series of 3D-printed devices that pair wirelessly with an iPad Mini. Both solutions use the mobile device itself, smartphone or iPad, to provide multimedia instructions to anyone using the kits. (Backup printed instructions are also included.) Ideally, the various diagnostic and monitoring devices can be used by anyone and do not require medical training. The Final Frontier tricorder was developed by Pennsylvania brothers Basil Harris, an emergency room physician, and George Harris, a network engineer. As per the competition rules, both devices can test for core conditions including anemia, atrial fibrillation, chronic obstructive pulmonary disease, diabetes, leukocytosis, pneumonia, otitis media, sleep apnea and urinary tract infection. In addition to the core conditions, the devices must detect three elective health conditions from a set including HIV screen, hypertension, melanoma, shingles and strep throat. Both devices will now move to the final stage of the competition, hands-on consumer testing at the Altman Clinical Translational Research Institute at the University of California San Diego. The first prize winner is awarded $6 million, with $2 million for second place and $1 million for the team that receives the highest vital signs score in the final round. An additional $1 million has already been awarded in milestone prizes. 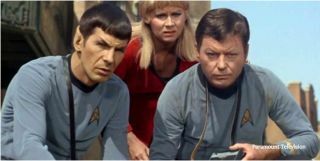 In press materials, Paul E. Jacobs, executive chairman of Qualcomm, said that Star Trek has actually provided more than one sci-fi scenario to inspire real-world innovation. "The Communicator preceded the smartphone, which has revolutionized our personal interactions, and provided instant access to knowledge and entertainment," he said. "Star Trek has inspired many engineers on a quest to improve the world by turning science fiction into reality."